Our school is made up of four house groups: St Aidan, St Bede, St Cuthbert and St Hilda. We have a point system and at the end of the week we have a celebration where we add up each team's scores and announce the results. The winning house is announced in our Certificate Assembly. You can be awarded house points for all sorts of things; a good piece of work, sitting smartly, lovely manners and so on. When you have been awarded house points, you can keep jotting your points down throughout the week on the chart. Good luck everyone ~ remember, great work, good manners and an excellent attitude will earn you points! St Aidan was the first recorded inhabitant on Lindisfarne. He was an Irish monk from the monastery of St. Columba which he had founded on the island of Iona. In 633 Oswald established himself as king, choosing Bamburgh, as his main fortress. He invited the monks of Iona to join him and Aidan arrived with 12 other monks and settled on the island the English had renamed Lindisfarne. In the monastery, the monks lived a life of prayer and study. They often went out on mission, talking to all of the people they saw, trying to interest them in the faith. Aidan had to make sure that his efforts to spread Christianity did not fade out after his death so he decided to educate the next generation of leaders. Irish monks were very keen on Christian education, which required the new skills of book-learning, reading and writing and Latin - the language in which all the books they could obtain were written. They began with the 150 psalms (in Latin) and then went on to the four gospels (in Latin). Such education at this time could be obtained only in monastic schools. Aidan began with 12 boys, who of course would learn the practical work of being monks, priests and missionaries by observing and working with the older monks. It seems to have been a good system. The monastery on the Island was for men and boys only but Aidan made sure it was possible for women in Northumbria to become nuns if they wanted to. After 16 years as Bishop Aidan died at Bamburgh in 651 AD. St Bede was born in Monkton in Jarrow in the year 673 AD. When he was 7 he went to live at St Peter’s Monastery in Wearmouth. Later in his life, St Bede moved to St Pauls in Jarrow where he stayed for the rest of his life. St Bede never travelled any further than Hexham, Lindisfarne and York. 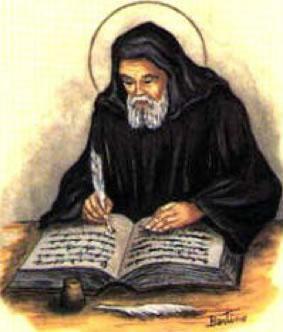 St Bede was a scholar and he was renowned throughout Europe. St Boniface wrote that he “shone forth as a lantern in the Church”. St Bede also wrote books about the scriptures, about the life of St Cuthbert and was the first writer to use the AD Dating system. His last work was a translation of St John’s Gospel into Old English. St Bede is buried in Durham Cathedral. When she was born, her uncle was the King of Northumbria – King Edwin of Northumbria. St Hilda spent her early childhood in a pagan environment and was baptised at the age of 13 when the royal household embraced Christianity. 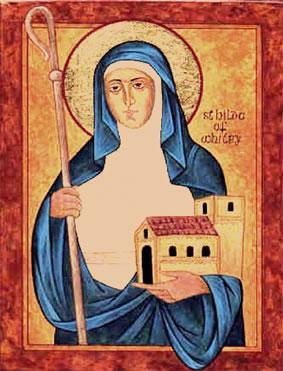 St Hilda became a nun at the age of 33. An abbess is the female superior, or mother superior, of an abbey of nuns. In 657 AD St Hilda moved to Whitby and set up a Monastery overlooking the coastline. St Hilda taught people about peace and charity among other virtues. 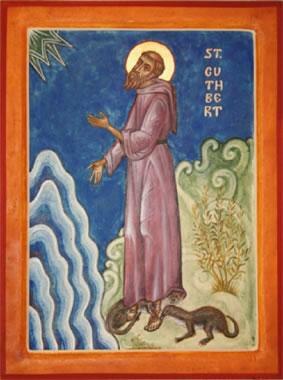 Cuthbert was born in Northumbria in 635 and brought up a Christian he saved the lives of some monks who were being swept out to sea on a raft, using the power of his prayers. When Cuthbert was 17 years old he was looking after some sheep on a hill. While gazing into the night’s sky he saw a light descend to Earth and then return, escorting, he believed, a human soul to Heaven - that was his moment of decision. He went to the monastery at Melrose, was admitted as a Novice and stayed for 13 years. When Melrose was given land to found a new monastery at Ripon, Cuthbert went with the founding party and was made guest-master. In his late 20s Cuthbert became prior (second to the Abbot) at Melrose. Cuthbert was an outgoing, cheerful, compassionate person but when he was 40 years old he believed that he was being called to be a hermit and to do the hermit's job of fighting the spiritual forces of evil in a life of solitude. For a short time he lived on the tiny islet adjoining Lindisfarne before he moved to the more remote and larger island known as 'Inner Farne' and built a hermitage where he lived for 10 years. People did not leave him alone - they went out in their little boats to consult him or ask for healing. At the age of about 50 he was asked by both Church and King to leave his hermitage and become a bishop. He reluctantly agreed to be a Bishop at the age of 50 and spent 2 years travelling extensively.